The next Revolution is happening now: Kevin, Nick, and Cass are lucky —they live with their parents in a secret human community in the woods, safe from the Bot City established after the robot revolution of 2071. Then their village is detected by bots and completely destroyed. Hopeful that their parents have been captured by bots --and not killed--, the teens risk everything to save the only people they have left in the world—by infiltrating a city controlled by their greatest enemies. In Fugitive X, Nick, Cass, and their little brother Kevin are separated by warring forces in a dystopian world controled by robots. Nick ends up with a group of hostile rebels. Cass is captured and reeducated by the bots. Kevin is indoctrinated into a hidden encampment in the forest known as The Island, where he discovers secrets about the origin of the bots, and about his family. This sci-fi trilogy by Gregg Rosenblum is one of my favorite new series. 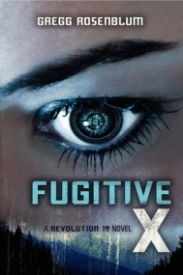 Revolution 19 was published last year, and Fugitive X came out this January. The alternating perspectives between Nick, Cass, Kevin, and the Bot Leader (!!!) are my favorite part of these books. Switching perspectives every single chapter is a very grown-up sci-fi thing to do, and Gregg Rosenblum manages to not only pull it off, but do it so well that it isn't confusing, jarring, or difficult to follow at all. The characters are well-developed and more than different enough from each other to keep it interesting. Nick is a tough guy with a soft spot for his siblings. Cass is practical girl dragged into the robots' world against her will. Kevin is clever, funny, and so very feisty. The robot leader is just so strange. The supporting characters, some Freemen from the forest, others City-dwellers, are very cool as well. The dynamic relationships between the characters is a little different from Revolution 19 to Fugitive X -- Rosenblum takes a step back from the techy side of things and focuses on conflict between sides in the war, tension between friend and foe. I absolutely loved that about the second book. The action in both books is dramatic, fast-paced, and violent without being too gory or intense. It's also somewhat unpredictable, which I appreciated. You never know who is going to get kidnapped by bots, or when something is going to explode. At any moment someone could get lased or somehow take out a bot all on their own. Rebels could show up to save you or bad guys could knock you out and drag you away. 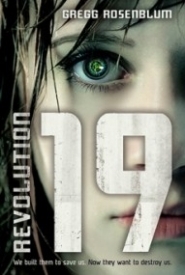 I would highly recommend the Revolution 19 series to anyone who likes sci-fi, robots, and intense action.